A rundown on all things writing related. 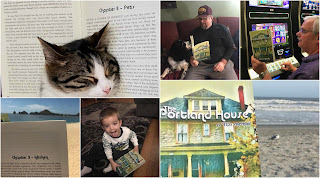 As part of my Portland House book release, I am running a giveaway contest. I ask people to take a photo of them with the book in a unique place, or even just around the house somewhere. Then, on March 17th, I plan to draw two winners from the entries and send them a signed copy of the book. I ran the contest with Dirty Shirt and had a lot of fun with it. I look at it as a unique way to engage people with the celebration of launching a book as well as getting a chance at a free book. In this day and age, people are all about selfies and pictures from their phones, so it seems like a good match. Some of the entries have been from sunny beaches, including Florida and California. Others were taken with pet cats and even a goat. I can't wait to see what else comes in as more people get the book. In an interesting and unexpected development, my chapbook On a Road was recently accepted for publication by Unsolicited Press. For those who don't know, and it appears more don't know than do, a chapbook is a collection of less than 25 poems. This one is a series of poems about a road trip to California that I took with a couple of friends in 1984 when I was just 22 years old. It is styled after, and in homage to, Kerouac's novel, On The Road. I don't know much more than the contract that I signed is being reviewed, but it is certainly exciting news on the heels of The Portland House book release. There is a good chance I will have a review from The Shepherd Express newspaper this week. They typically come out on Thursdays, so look for it wherever you find the Express! There is also a good chance Mary Ann Grossman from the St. Paul Pioneer Press will be reviewing The Portland House in the next couple of weeks. This is huge visibility for me. I also have inquiries out for a couple of radio interviews, but no word yet. Fingers crossed. There is another very exciting development brewing. I can't say much about it until it actually happens, but I will certainly make it known if it does. I am always looking for Amazon reviews. If you've read the book and enjoyed it, I'd love to get a few words on the Amazon site for the book. I am up to four, but for a little perspective, Dirty Shirt has 41 reviews. They help me as an Author and don't take too much effort from readers. It is appreciated! So, it is all coming together. I am blessed to be where I am with my writing right now. Lots of work, but all good.